Copper is considered as one of the first metals to be used by humans and has a fascinating origin story dating back to the Bronze Age. In fact, the discovery that with a little bit of tin, copper could be hardened to form bronze alloy is what led to that era in history being christened the Bronze Age. 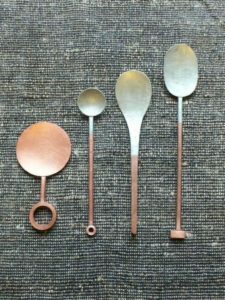 This copper-tin alloy was widely used in the ancient world to make coins, cutlery and tools and the era provided its civilization with the technological advantages that were necessary to advance forward in time. 11,000 years ago when copper was first being put into use, ancient societies had no information about the metal and as a result the metal was under-used. Since ancient societies lacked modern knowledge and scientific know-how about metallurgy they began to use the metal more for decorative ornamental purposes than for its inherent scientific properties. Ancient men realised that copper on its own was too soft to be used on its own for any purpose which then led them to combine the metal with other metals to strengthen it. The most common combination was with tin to form bronze. In the US, Copper was one of the metals that was used to make coins along with gold and silver but since it is the most abundant metal, it came to be the least valued. However, today all coins in the US are copper alloys, tossing up the value of copper greatly. In Northern Iraq, copper beads which were more than 10,000 years old were excavated and presumed to have been produced from native copper nuggets. In the modern world, copper has come to occupy a more central role as an excellent conductor of heat and electricity, making it the perfect metal to be used in electrical equipment like motors and wiring. Copper directly aids and assists in contributing towards advancement of technology in the modern world. The earliest extraction and smelting of copper ores is believed to be the outcome of experiments while trying to understand what rocks could be smelted. Fast-forward from the era of accidents and experiments to today where copper smelters have sound technical knowledge and advanced technology to smelt copper with minimum production of waste. Sterlite Copper is today, one of India’s most advanced smelters in terms of technology and waste management practices. The smelter has the capacity to produce 4 lakh tonnes of copper per annum and contributes to 34% of India’s copper production. The smelter functions on the technology provided by Mount ISA Mines, Australia and stands as a stark contrast to early societies which functioned on experimentation. The company is far more environmentally conscious than many other smelters across the world and employs proven energy efficient and environmentally friendly technology such as effluent treatment plants and solid waste treatment plants in addition to being a zero liquid discharge plant. Copper over the decades made its way into main stream or new markets due to its high electrical and heat conductivity property. In other words, the new age metal is a material of choice for various domestic and industrial purpose today. Comfort electronic goods such as air conditioners, refrigerators, television sets, induction stoves, etc., would not exist without this magic metal which supersedes any other metal on earth for its conductivity. The evolution is still on the run, due to the realisation of the metal’s application in electrical cars, health sector due to its anti – microbial properties, harnessing renewable energy to create a sustainable earth, etc. We at Sterlite Copper believe that domestically processed copper would equip India to locally manufacture various copper products which would otherwise be too exorbitant to produce.